Add some fun and freedom to your next visit at Ocean’s Reach by renting your own snazzy electric cart! Sanibel Carts is our local source for street-legal, solar-paneled electric carts. They offer door-to-door delivery, along with knowledgeable and friendly service and top-of-the-line vehicles. In Florida, a street-legal golf cart is a golf cart that’s equipped with seat belts, turn signals, mirrors, and other safety features. Every Sanibel Cart includes these mandatory features and is titled and registered in the State of Florida. They even come equipped with an official “B” parking sticker from the City of Sanibel to make parking a breeze! 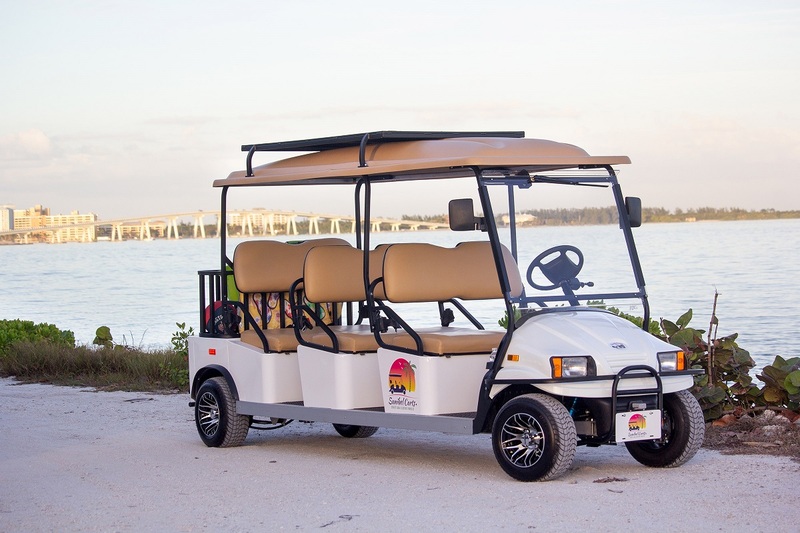 Sanibel Carts has announced the addition of solar panels to their entire fleet of 4-seater and 6-seater electric carts to help reduce guest carbon footprints. Park in the sunshine to let the solar panel on top of the Cart to help top up the battery. The Carts can travel approximately 35 miles on a full charge. You can travel from Lighthouse Beach Park on the east end of the island all the way to the shops and restaurants on Captiva Island and back in just under 30 miles. You must be 21 years old to rent or drive a Cart. The Carts may only be driven on the roadways on Sanibel Island and Captiva Island (not on beaches or bike paths) and the Carts cannot leave the perimeter of Sanibel Island and Captiva Island (they cannot be driven on the causeway). Cart around the island in style on your next vacation! For more information — including how to arrange for free delivery and pick-up — call Sanibel Carts at 239-500-CART or visit their website at sanibel-carts.com. Thank you for highlighting Sanibel Carts! A very fun way around the island.